Something like 3 million US citizens passed through the United Kingdom during the Second World War. The Cambridge American Cemetery commemorates almost 9,000 Americans who died while based here, or en route, in those years of conflict. They died at sea on convoys transporting essential supplies, troops and military equipment, across the Atlantic; they died in the air attacking targets over Germany and occupied Europe, or defending Britain’s coast; they died preparing for Operation Torch, the invasion of North Africa in November 1942, and Operation Overlord, the invasion of Western Europe in June 1944, or from wounds received in action; they died in enemy air raids on this country; they include civilians as well as service personnel, women as well as men – and six children. Some died even before Japan’s strike on Pearl Harbor in December 1941 sparked the United States’ entry into the war; they were merchant seamen, or volunteers fighting alongside Britain. 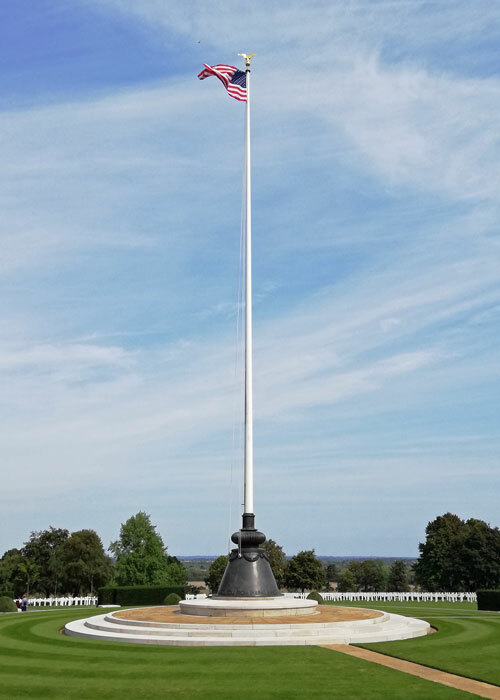 Eighteen Americans serving in Britain’s armed services, mostly the Royal Air Force or Air Transport Auxiliary, and one Canadian of the Royal Canadian Air Force, are buried in the Cambridge American Cemetery. 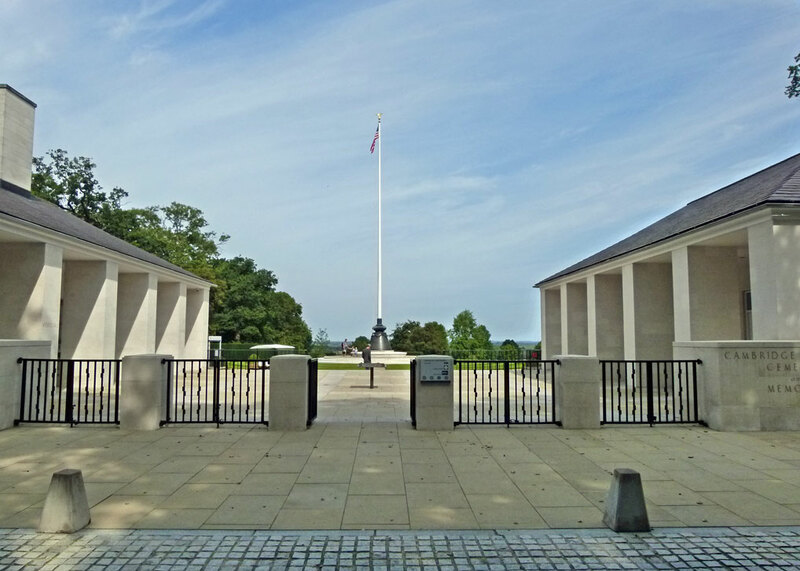 The Cambridge American Cemetery is the only World War II American military cemetery in the United Kingdom. The site was established as a temporary military burial ground in 1943, on land donated by the University of Cambridge, and has been granted free use in perpetuity by HM Government. It was dedicated in 1956, covers 30.5 acres and lies on a gentle slope overlooking farmland. Simple, white marble, headstones – mostly crosses – mark the resting place of 3,811 of America’s war dead. They line up in parade-ground precision, pure white on green, the graves radiating out, theatre-style, from a grand flag pole where the Stars and Stripes flutters and flaps in the breeze. The arrangement has been likened to the spokes of a wheel, an aeroplane propeller, or a baseball field. To the east of the main entrance is the Great Mall, where beds of deep red roses surround serene reflecting pools. On the southern edge of the Mall, the 472 foot (144 metre) long Portland Stone Wall of the Missing records 5,127 names – people who have no grave – lost or buried at sea, or missing in action. Rosettes mark those whose remains have since been recovered and identified. The Wall is guarded by statues of a soldier, sailor, airman and coast guardsman. The Mall leads to the Memorial Building, also constructed of Portland Stone, where great teak doors decorated with bronze representations of military equipment lead into an elegant ante-room. The ceiling is covered by an extraordinary mosaic, predominantly blue in colour, through which ghostly aircraft are depicted making their final flights. The mosaic continues into a small chapel displaying religious imagery with the words ‘Into Thy Hands O Lord’ in large bronze letters over the doorway. On the southern wall of the ante-room is an astonishing map, which is both tactile and curiously beautiful. Presumably named by committee, it is called “The Mastery of the Atlantic – the Great Air Assault Map”. 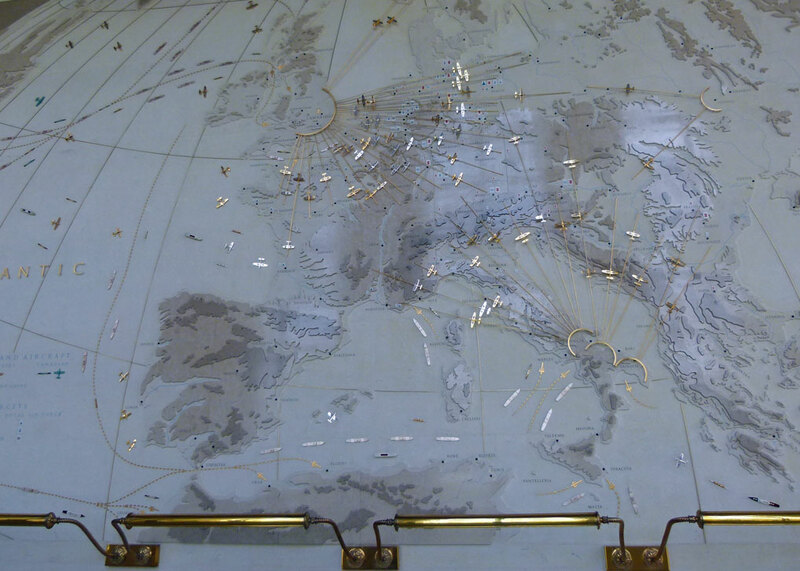 It shows the principal routes across the Atlantic, and the types of craft used, the aircraft (USAAF and RAF) engaged in operations – anti-submarine, bombing – and the routes to European targets. It is 30 feet long, 18 high (9 x 5.5 metres) and belongs in a (very large) text book; but it’s a work of art. It is also an illustration of sheer power. 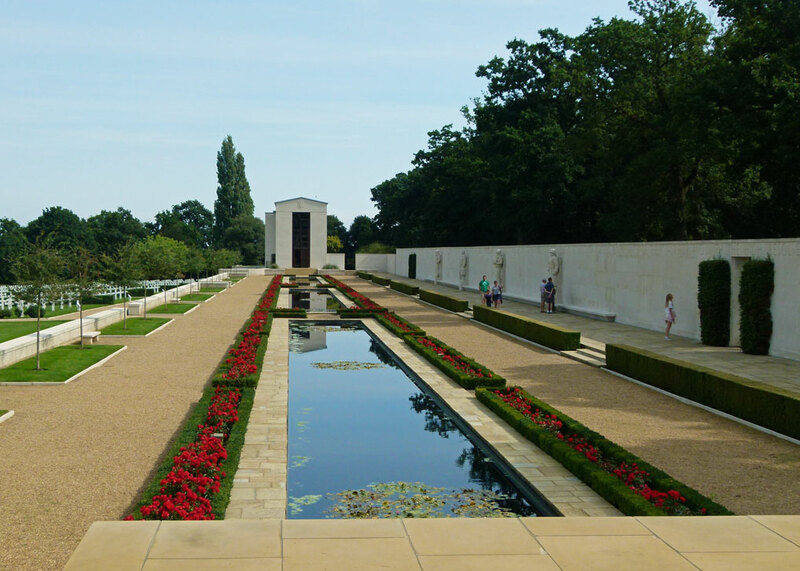 Close to the main entrance to the Cambridge American Cemetery and Memorial is an absorbing visitor centre. It tells the story of some of the men and women commemorated at this place and gently explains a little about US involvement in the Second World War, particularly the Battle of the Atlantic, the Strategic Bombing Campaign – and a little about Americans in Britain during those years. The personal stories are fascinating, and moving; big events are made by people and every perspective is unique. The visitor centre is extremely well done, respectful, yet captivating. 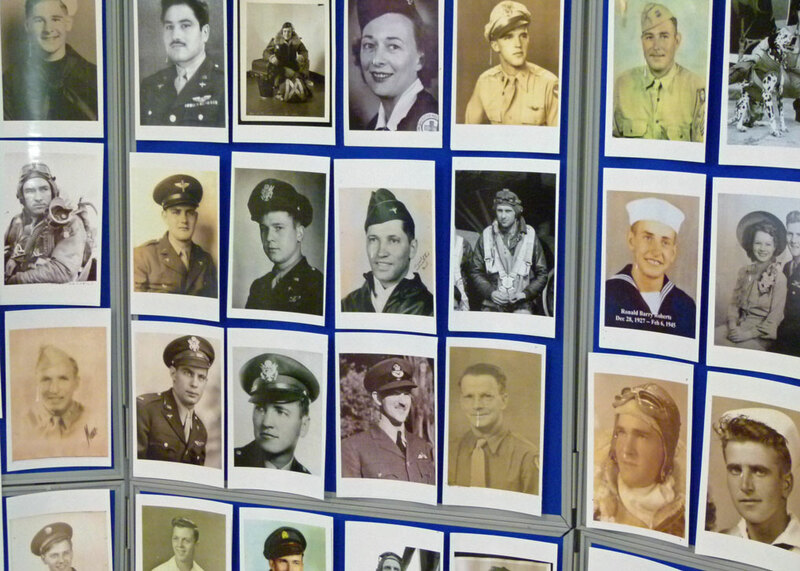 It not only puts those remembered in context, but almost brings them to life as well. In 2017, staff at the Cemetery launched an appeal for photographs of every man and woman it commemorated. I don’t know how they’re doing with that; but what a wonderful idea. There was a display of some of the photographs on the day A Bit About Britain visited. Inevitably, they were mostly young; frozen in time on the threshold of life’s great adventure, unaware they had so few days left when they posed for the camera. You can’t avoid your eyes moistening. Among the better-known remembered at the American Cemetery in Cambridge are Joseph Kennedy and Glenn Miller. Lieutenant Joseph P Kennedy Jr, US Navy Reserve, was flying a B-24 Liberator aircraft loaded with high explosive on a secret mission against a German V2 rocket site on 12 August 1944, when his aircraft exploded. He was the older brother of the 35th President John F Kennedy and son of the controversial Joe Senior. Major Alton Glenn Miller, innovative musician, composer and band leader, was flying to Paris from a small airfield near Bedford on 15 December 1944, to make arrangements for a Christmas broadcast, when his plane vanished over the English Channel; it has never been found. Whether or not there is any such thing as ‘the special relationship’, durable bonds exist between the United Kingdom and the United States; two strong allies with a mutual heritage divided by a common language. Though it would be naïve to ignore the differences, tensions and suspicions between the two nations – before, during and since WW2 – we undeniably share much, and there was an unquestionable unity of purpose in defeating Hitler and restoring ‘freedom and democracy’ – albeit these can be subjective terms. If there was ever such a thing as a just, or necessary, war, it was the one that had to be waged against Nazi Germany and Imperial Japan. After the Soviet Union and the United States joined forces with Britain and the Commonwealth, winning became a matter of when, not if. However, whatever the propaganda said, other than the essential defeat of Hitler, the Soviet Union had little in common with most Britishers; and Soviet servicemen and women were far away – unlike America’s. So, just as a visit to America’s Second World War cemetery and memorial in Cambridge recalls the individuals who are commemorated there, it also reminds us of the ‘friendly invasion’, when so many Americans made their temporary homes in Britain. They – including those who gave their lives – did not exist in isolated American enclaves – though the Americans certainly built their own massive bases – but would also have experienced our pubs, high streets and homes. The first US troops stepped ashore in Belfast in January 1942. By 1944, during the build-up to D-Day, Americans were everywhere. Issued beforehand with a handy (and amusing) booklet ‘Instructions for American servicemen in Britain’, they discovered that ‘British reserve’ did not necessarily mean that people were unfriendly, that ‘bum’ and ‘bloody’ were words to use with care, that British cities really did not have skyscrapers, the coffee was awful – if any could be found – but that warm beer could be OK. The British discovered that not all Americans resembled Hollywood movie stars or pistol-toting cowboys, but were much better paid than home-grown servicemen; and their uniforms didn’t scratch… GIs – slang for American troops (the term may have come from ‘Government Issue’ or ‘Galvanised Iron’) – were described by their British counterparts as “overpaid, oversexed and over here”. The GIs allegedly retorted that British Tommies were “underpaid, undersexed and under Eisenhower” – two of which accusations were certainly true. Some 70,000 British women married American servicemen and an estimated 9,000 babies were born out of wedlock. The GIs introduced Coca-Cola, doughnuts, pinball machines, jukeboxes, good music and were generous, often supplementing meagre British rations with exotic foods not available in the shops. The traffic was not all one-way; most Americans had never been away from home, were lonely, and found unconditional friendship in these islands; little pieces of British culture and language found their way back across the Atlantic too. Oddly enough, for a country with an empire that was arguably institutionally racist and where, as recently as the 1960s, it is alleged that signs on boarding-house windows warned, “No Irish, no blacks, no dogs”, Britain struggled with the American practice of racial segregation. 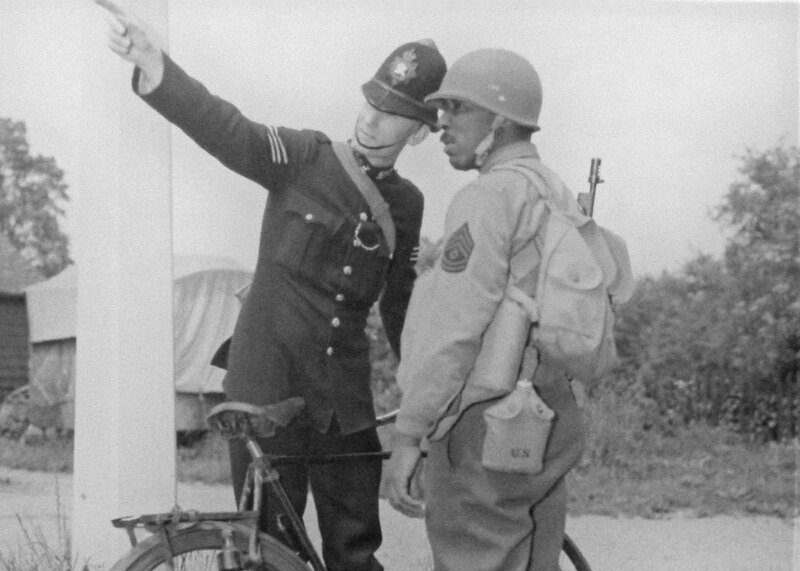 During WW2, around 100,000 black US troops arrived in the UK, where the black population at the time may have been around 7,000. American troops were segregated here as a matter of policy, in the same way as they were in the USA, and I am genuinely proud that this decision resulted in problems between local British populations and American military authorities – both of them white. There’s a fascinating interactive presentation about Americans in Britain on the website of the American Battle Monuments Commission. There are stories behind the stones at any cemetery, but visiting a military cemetery is invariably a sad and humbling experience too. The American Military Cemetery in Cambridge is certainly that; but it is also a beautiful place, and one which puts its own perspective on the sometimes cold pages of history. This is really interesting. 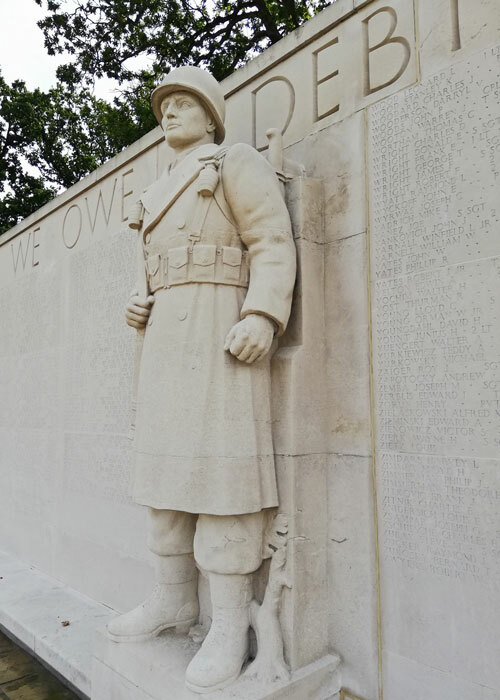 The memorials alone are a good reason to visit, but there’s also some interesting history behind Britain’s perspective of the war, especially the segregation. Thank you! It looks like a beautiful place. It’s wonderful that Cambridge allowed a temporary cemetery to become such a monument. My father headed the U. S. Army’s American Graves Registration Command (AGRC) in Paris (1947-1950). The following information is from his biography, “A Salute to Patriotism: The Life and Work off Major General Howard L. Peckham.” At the time of his arrival in Paris, the U.S. dead of the European Theater were resting in 37 temporary cemeteries scattered throughout the Continent. Under his command, more than 80,000 of those heroes were returned home. 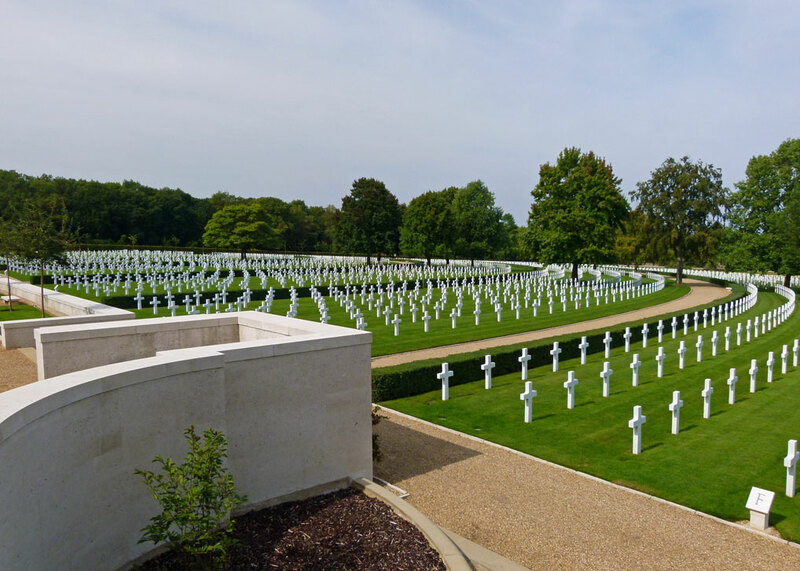 Approximately 60,000 others were buried in10 permanent American military cemeteries in Europe, including the one in Cambridge. They were graded and constructed by his command on land donated to the USA by the countries where they cemeteries are located. All but one were built on the site of a former temporary cemetery. Thanks for dropping in and adding that information. You must be very proud of your father’s role in all that. I have a comment and as question. First, you ask, “Were there really only two faiths in the United States of the 1940s?” Well, essentially, yes. The other symbols offered at Arlington are a relatively new phenomenon. Second, how can I contact the Visitor Center about sending a photo to their collection? I have looked online and can’t find anything. Thank you for any help you can give! 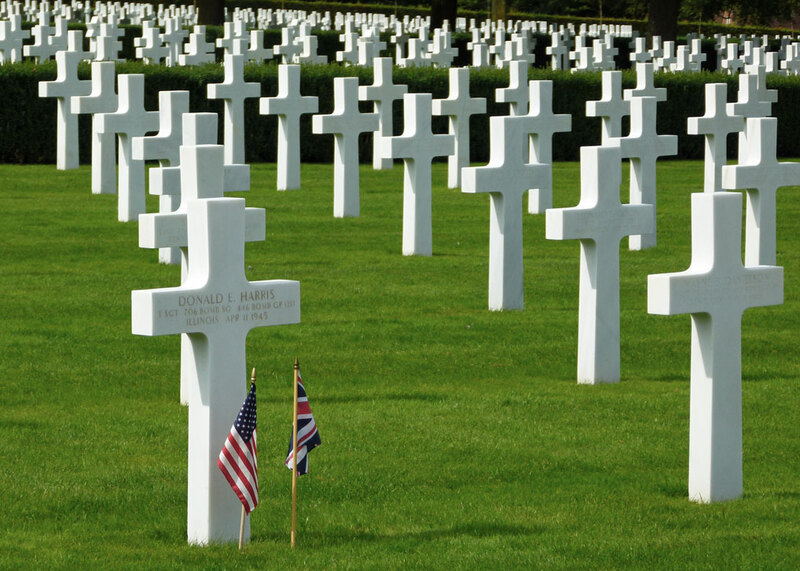 There’s a contact form on the American Battle Monuments’ website – https://www.abmc.gov/cemeteries-memorials/europe/cambridge-american-cemetery#news-anchor – that’s probably the best place to start. There was a documentary on the BBC a few years ago (I’m in the US, so I streamed it) about children born of the alliance of British women and black US troops. It was really interesting. While on tour with a group from my alma mater, we were told (as we were passing) that there were no time to visit, but here was a WWII America cemetery. We insisted that we stop and were so impressed by this outstanding memorial. You have written and photographed it beautifully and accurately. The military cemetery in Los Angeles is the the final resting place of 80,000 plus 2 dogs. The white granite headstones are rounded rectangles with mostly crosses or Star of David insignias but there are also other symbols. Like Arlington (as you have aptly described) it is “immaculately elegant.” Every Memorial Day in May, the Boy Scouts place a flag in front of every grave. Something to see—80,000 flags fluttering in the breeze. As usual, your article is so well done. Thanks for the “re-visit” of such a special place. 80,000??! That’s horrendous. Those flags must be quite a sight. Glad you appreciated the ‘re-visit’ to Cambridge – and I appreciate your kind words, thank you. I really enjoyed this post and the accompanying photographs. We ran out of time when we were in Cambridge last year and didn’t get chance to visit. So it was good to be able to see it through your eyes. As always, Mike, your posts are eloquently written, well researched and so beautifully photographed. And they give us much to ponder in these days where peace seems so very fragile. What a beautiful, peaceful place this is — and the men (all men?) there deserve peace after their deaths. I have visited the cemeteries at Colville sur Mer and St. James and found them to be very similar. It’s a good feeling to be there and a bit overwhelming as well. Which leads me to my question. You wrote: “The Cambridge American Cemetery is the only World War II American military cemetery in the United Kingdom.” And I know you do your homework so if that’s the case, are the Colville or St. James cemeteries (and I presume others) NOT “WWII American military cemeteries”? And if not, what are they — what’s the difference? Hi Mike – fascinating and thorough as I know your posts to be … I must visit when I return. I remember something about the German cemeteries being set up and the difference between other cemeteries because of the ‘conflict’ … I’m sure somewhere there’s something about them. It was via a tv programme that I noted it – British programme – whether BBC or Channel 4 I’ve no idea now. “…big events are made by people and every perspective is unique.” An excellent point – one that brings a real personal note to something as vast as World War II. I think my eyes would get quite moist as well! Beautiful pictures – would love to visit there someday. You’d really get something from the visit, I’m sure. Afterwards, you could pop down to Duxford. Oooooh I think I would like Duxford! One of these days I have to do another extended trip to England. Last time we blew through way too fast! Another great historical and educational post, Mike. I can see how humbling it would be to visit. Thank you, Ellen; it certainly is – places like this really make you think. Thank you Mike: a moving, respectful, and evocative piece, deserved by all those young men who died that we might live in freedom. Thanks, Michael; I hope it was. Excellent, Mike. Outstanding. What a treat it is to be closing the Thanksgiving break, with this. Thank you. All the best, Rick. A cousin of my mother’s was one of the many women who married an American serviceman. This is a most lovely, peaceful place and so well tended. Thank you for this moving post, Mike. Thanks, Clare; it’s definitely worth spending some thoughtful moments there. What a beautiful place, and these soldiers (and a few others) deserve nothing less. Thanks for all the wonderful details. Interesting statistics about the numbers of black troops compared to the number of blacks in Britain. Thanks, Cynthia; it is a beautiful place, and full of stories. Thanks, Kay. I really appreciate your comment and the information. It’s hard not to stop and look at every memorial at these places – but I promise I’ll look him up if I visit again! The Battle of the Bulge was very ugly; I think ‘Band of Brothers’ covered it very well. Is it strange that a place of mourning is beautiful? Yes – weird, but true! And maybe fitting. Thank you for your detailed article on this cemetery. My grand-uncle, Earl Wellington Watson, is buried there. He died August 14, 1941. He was part of the crew ferrying a bomber over and something went wrong and it crashed on landing. I had not heard they were looking for photos. I have one, although it is not very good. I will visit the web site and find out if it meets their requirements. My pleasure. As you know, that was before the USA came into the war – and I see your uncle is listed as being in the RAF Ferry Command. So many accidents, not just combat losses. I bet they’d love to get a photo of him. I have visited many war cemeteries, but I hadn’t seen a layout of graves similar to your second, Cambridge photo. I thought the white marble graves radiating out from a flag pole was a bit strange, but an aeroplane propeller shape makes sense. British, Australian and other Commonwealth men who died in Europe could not be taken home by their families and had to be buried where they fell. Were American parents also not allowed to repatriate their sons’ bodies? It is hardly surprising that German military cemeteries or memorials are rather on the dark and sombre side – after all, “we” started those wars and still feel responsible for having brought terror and death across way too many lives. Dark and sombre are, though, definitely not national characteristics – at least I can not say there is more darkness etc. in the characters of my friends, family, colleagues that are German (or in myself). Anyway, this was very moving and touching, and I could write the longest comment EVER if I didn’t feel it inappropriate. Thank you for all this. Meike, if there are such things as national characteristics (maybe stereotypes?! ), I don’t really believe they are reflected in cemeteries. In fact, I remember that the German cemetery at Cannock Chase – is not in the least bit gloomy, though the stones are dark. But the German cemetery at Langemark in Belgium has a very sombre feel. Nor is it true to say that “you” (ie the German people of today) are responsible for events that happened so long ago or could not influence – that would be ridiculous. Actually, from a historical point of view, it is not accurate to blame Germany for WW1 – though it may be convenient to do so. There were heaps of complex factors at play in 1914, but given the background I believe the two decisive acts that virtually guaranteed a general European war were 1) the attitude of Austria-Hungary toward Serbia and 2) the Kaiser’s ‘blank cheque’ to his ally. As for WW2, well we can certainly lay the blame with Herr Hitler – but maybe the settlements reached by the Allies after WW1 helped create the climate where someone like Hitler could gain power. That said, someone should have taken him out! Anyway, I’m glad you found the article moving and very grateful that you left your comment! Thank you, Mary; much appreciated. I’m glad the article touched a spot. Thanks Mike. Always interesting to hear your perspective. Don’t know if you intended it to show up on our Thanksgiving Holiday; but in an odd way that seems appropriate. Actually, it was planned, Mark – albeit wasn’t published until a day after the main event! What a beautifully written tour of this memorial. I hope it’s all right that I shared it on my site? Mike, thank you for posting this. You’ve written a fine tribute to those who are buried there. You mention the equality of how the ranks and officers are buried together. This is the case at the military cemeteries in San Bruno, California (on the Peninsula south of San Francisco) at the cemetery in the Presidio in San Francisco and the Sacramento Valley cemetery on Midway Road south west of Dixon, California. At San Bruno, four U.S. Navy Admirals and their wives are buried together: Admirals Nimitz, Spruance, Turner and Lockwood. They served together in the Pacific under Nimitz. They all agreed that they did not want to be buried at Arlington (though they could have been), they didn’t want monuments – they insisted they receive the same slab tombstone as the ranks who served with them. Such a gesture was typical of Nimitz. I’ve heard of Nimitz and Spruance, but they all sound like my kind of military leader. Moving post, Mike, and I had no idea that was there. Anyway, the U.S. was founded on Judeo/Christian principles, and in the 1940’s most of the people who would have fought would have at least on the ‘roster,’ declared themselves to be Christian or Jewish, although of course there were other religions in a minority over here. I also wonder if pragmatism of time and uniformity (of display aesthetics) had something to do with it. This looks like a beautiful place. Reminds me of Arlington National Cemetery, which was, at one time, Robert E. Lee’s backyard. I always enjoy seeing how WWII American soldiers are portrayed in British mysteries. The term ‘ugly American’ isn’t without foundation. Enjoy your trek to the Great North. ‘Ugly’ is ubiquitous. I’d be awed to visit Arlington. Just a note that I can’t resist posting. “The Ugly American” was the title of a book about a man who was very ugly but actually very nice. The term has been completely misused almost from the start. Odd, isn’t it? When I think of the term ‘ugly American,’ regardless of it’s origin, I think of people who travel abroad and complain (loudly) all along the way because they can’t find a McDonalds close enough or their hotel room doesn’t have enough space for their ten pieces of luggage they brought along, etc. etc. I think we are all embarrassed by our fellow-countrymen/women sometimes. Some Brits at home make me cringe, let along abroad! What a beautifully arranged place, as you said. I love this post! You must have spent quite a bit of time there, when you went. I think that, before recent memory, our nations thought of themselves as Christian. 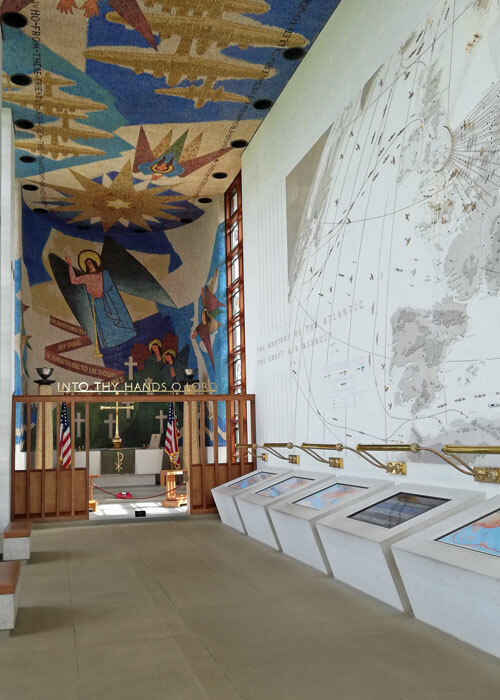 Hence the crosses, but also the religious imagery in the Memorial Building. If it were to be built today I’m not sure those things would be included in this post-Christian era. But that map is fabulous-looking! Brill post Mike, this is a must see, for me, might have to add it to my Duxford trip next year! Duxford’s just down the road, Fraggle. Allow at least a day for that. And visit the Cambridge Colleges while you’re in the area! So very nice of your to post this about our forces and those who died for freedom. Thank you very much my friend. Was thinking of you as I read this, glad you saw it. It’s one of those places that has to be written about; AND it makes you think. In one sense, it’s no different from any other military cemetery – but they all have to be looked at in context. These place are so moving. I visited a Canadian War Memorial Cemetery in Holland and was moved to tears. An excellent description of this one. Thanks.